This article first appeared in The Edge Financial Daily, on June 14, 2018. 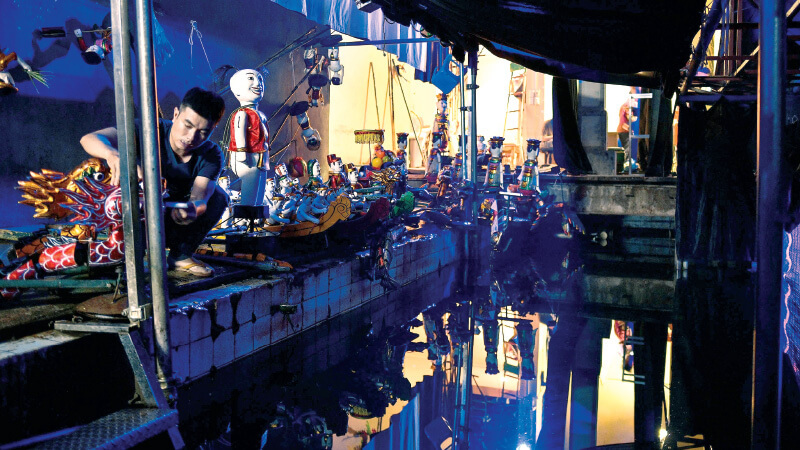 In a darkened theatre in central Hanoi, a wooden dragon emerges from a pool to the sound of cymbals crashing in a traditional water puppet show that lures hundreds of tourists daily but is largely shunned by locals. “But our years of training and experience helps us control them,” said Hoai, who like many of her colleagues graduated from Hanoi’s College of Theatre and Cinema. Some of the puppets weigh as much as 10kg and the largest ones, like the one-metre-tall (three-foot) fairy, require four people to manipulate. “I’ve never seen a puppet show that way with the water,” American tourist Caroline Thomoff told AFP after a show. The tropes have not changed much, and neither have the hand-carved wooden figures of animals, boats, farmers or fish painted in brilliant golds, reds and greens, according to Chu Luong, the director of Thang Long theatre. “When our children and later generations see performances they will be just like the original versions,” he told AFP. Despite its ancient roots — or perhaps because of them — the shows draw little attention from local Vietnamese viewers, especially millennials. Like other puppet craftsmen in the village, Viem does not earn enough to support his family making the marionettes so he picks up work on the side as a manual labourer. Canadian director Robert Lepage returned to Toronto this year with an adaptation of Stravinsky’s opera The Nightingale, in which the orchestra pit was transformed into a pool of water for singers-come-puppeteers commanding marionettes. For puppetmaker Viem, such innovative approaches may be the secret to reviving the centuries-old tradition among locals.